Fru-Gal.org: Kroger and Affiliates: Free Friday Download! 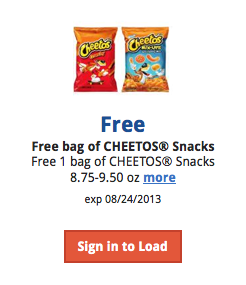 Kroger and Affiliates: Free Friday Download! Kroger grocery stores and affiliate chains have started a free Friday download every Friday where you can load a digital coupon to your shopping points card to get a free item. My affiliate store here is King Soopers and, so far, I have gotten free granola bars, toothpaste, salsa, shampoo, and this week's is a free bag of Cheetos. The download is only available on Fridays, so hurry up and get yours! One free item every week is a pretty good deal to me and a great way to save a few bucks off your weekly grocery budget.